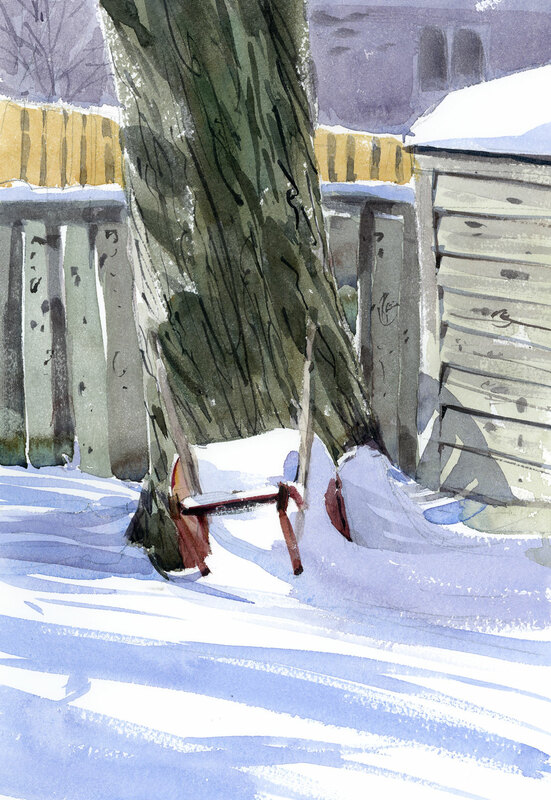 It’s too cold to paint outside this week — even in a pre-heated car — but the trusty wheelbarrow is always there for me. It looked especially fetching in the sun today, under a blanket of fresh snow. I guess over the years I’ve become a lover of winter sketching, despite the discomfort I sometimes have to endure to get the sketches finished. If you’re curious about my do’s and don’ts for winter sketching (some of which you may have already read in my numerous winter blog posts!) have a look at Studio56.com. There’s a great interview by Brenda Murray, including my colour recipe for shadows on snow. And while you’re there, check out the store too. You may decide you need this or that. I’m curious, do you ever take a photo then take it home and paint? Do water paints freeze in the sub-zero temps? Thanks, I like your paintings. Jacques, when it’s really cold out I do take a photo and then paint at home in my studio. I often see things I want to paint when I am out walking my dog, so I take a quick phone pic and paint when I get home. I can’t do watercolours outside in winter, but if my car is warm I can paint in there, except on really cold days when the water freezes even in the pre-heated car. You have a way of capturing the important things in life. It would be fun to see the whole wheelbarrow series together. It has become a friend. And a very lovely painting. Shari, I did see this. I even commented on it! Senility has set in.